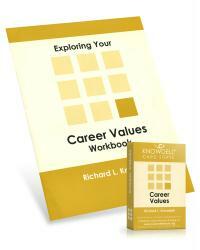 A simple tool that allows clients to prioritize their career values in as little as five minutes. Cards list 41 variables of work satisfaction - such as time freedom, precision work, power, technical competence and public contact. This is an effective tool for job seekers, those fine-tuning their present jobs and career changers at all ages and stages. The kit includes guidelines for counselors and group facilitators, an overview of values, and their role in career decision making, explicit instructions for the individual user, and supplementary activities for further clarification of career values.